MEN'S BASKETBALL - Every Thursday evening at 6 pm in the Gym for a great workout and healthy fun! 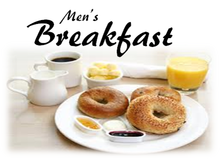 MEN'S BREAKFAST - Join the men the 2nd Saturday of each month right here at the church at 8 am. YOUNG at HEART BIBLE STUDY AND LUNCH - Something special for our seniors. The first Tuesday of each month at 11 am. A great time of study in the Word followed by a meal prepared especially for you.